As described, dog ring worm is also called “Dermatophytosis”, which is caused by a fungal species termed “Dermatophytes”. In dogs three types of dermatophytes have been identified as causative agents of dog ring worm. These are Microsporum, Trichophyton and Epidematophyton. Microsporum; M. canis and M. gypseum are two species reported as causative agents for dog ring worm. These are generally single cell, spindle shaped fungus, ranging 100–160 um in size. These are highly transmissible species of fungi, and may also infect cats and humans too. 70% of all dog ring worm cases reported are caused by M. canis, while 20% of those are caused by M. gypseum. 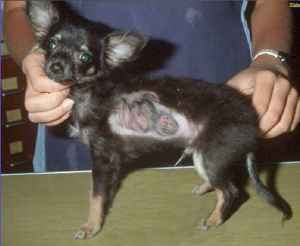 Trichophyton; In dogs, 10% of all cases of ring worm are caused by the specie of Trichophyton, called T. mentagrophytes. Trichphytons are generally spherical shaped dermatophytes, ranging 8–50 um in size. 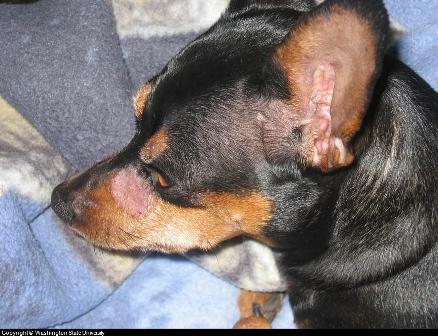 Clinically, dog ringworm is characterized by circular or ring shaped scaly hair loss. The appearance on the skin gives the condition its name - “Ring–Worm”. Broken hair, weakened hair base, hair loss, mild irritation, scales and distributed patches on the skin are common signs of dog ringworm. In severe conditions, inflammation of hair follicles and generalized patchy skin can be seen, with severe irritation. There can also be signs of a generalized illness such as fever, weakness and lethargy. Clinical signs are very helpful in identifying dog ring worm. Ring like appearances of hair loss on the body, especially on the abdomen and lateral sides, usually results in a ringworm diagnosis. In order to confirm and differentiate dog ring worm from bacterial folliculitis, dermatitis and demodecosis, usually a fungal culture is required. Samples are collected from the base of the hairs and are cultured in the laboratory for confirmation. The test requires 12–24 hours to complete. Most cases of dog ringworm resolve on their own; therefore, a treatment plan is only used to speed up the recovery and also to prevent the transmission and spreading of the disease to other dogs, cats and humans. Shampooing affected dogs with quality product containing “Enilclonazole” or lime-sulfur is considered effective, though there are some controversies related with whole body topical applications of anti–fungal agents. One lime-sulfur based shampoo and rinse to consider that is available without a prescription is Naturasil for Pet Ringworm. In chronic or severe cases, use of griseofulvin is recommended at dose rates of 25–100mg/Kg B.W. The formulation of grisofulvin is usually referred, per oral tablets and administered for 3–4 days. Some side effects of grisofulvin, such as gastrointestinal upset are possible in sensitive dogs, thus Terbinafine at dose rates of 30 mg/Kg B.W or Itraconazole at dose rates of 5–10 mg/Kg B.W can be administered as alternatives for dogs. Is ringworm contagious? Ringworm is highly contagious and can spread from pet to human (the most common zootonic disease - one that spreads from pet to human). The spores can spread from the dog and scatter throughout the home and stay in carpets, bedding, furniture and even your home's air filtration system. The spores can live up to 18 months. For this reason, it is a smart move to clean the home as well. This includes removal of any air filters in the heating/air conditioning system, thorough vacuuming and the use of a disinfectant designed to kill ringworm spores such as Benzarid.